ZARA leather skirt. COS mint green top. WERELSE x MANGO bag. H&M necklace. HERMÈS bracelet. ZARA silver shoes. CÉLINE sunglasses. This entry was posted in Outfit and tagged celine sunglasses, hermes bracelet, leather skirt, Outfit, werelse for mango by Carolina Engman. Bookmark the permalink. You look very good with mint!! Are you in Barcelona?! i never know how to combine that sweater – great one! Perfect combination of statement accessories!! Gorgeous outfit!! You look so beautiful!! Lovely combination, the black with the mint coloured top! It makes me long for summer even more! Love the mint and neon together, so unexpected but looks so good. The colors in your look are so refreshing and beautiful! I love the combo of colors, and the pops of neon!! The entire look is perfect! what a sweet look. 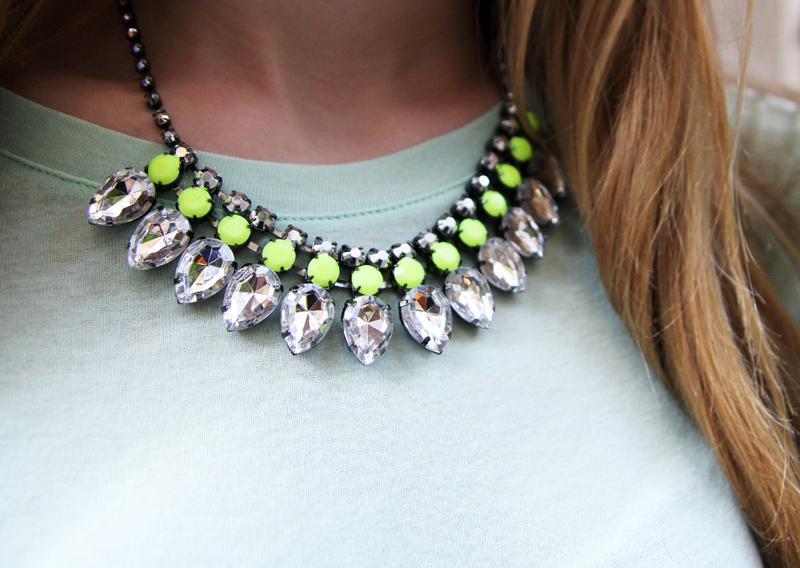 love the neon details! I love that pleated skirt and it looks so lovely with the mint sweater! Great necklace to go with it. amazing photos, you are looking foxy! Love the bag and the necklace, Brilliant!! I love the mint paired with your red lips. Perfection! I actually just did an outfit post on bike riding, take a look! 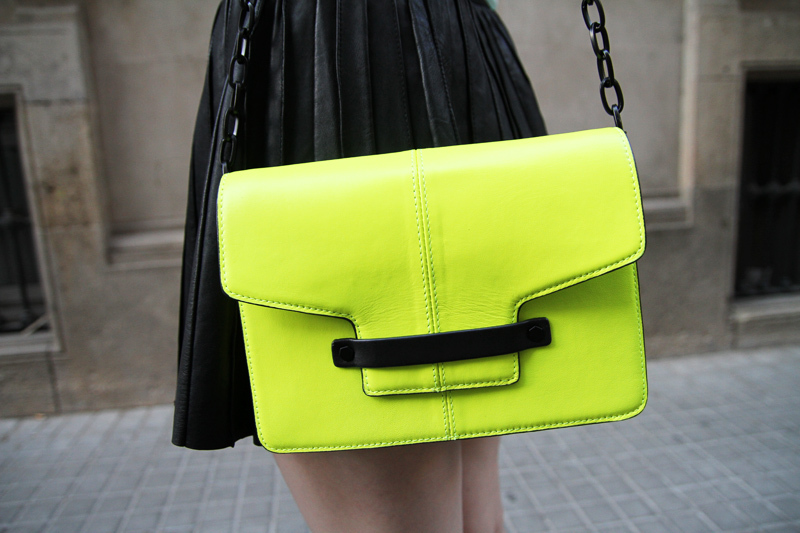 Obsessing over your neon bag – it is perfect! That skirt is so versatile! I have the same bag & necklace…love them both! You look so stunning. What a great look! One of my fav outfits! love it so much! Beautiful outfit! Beautifuyl skirt and love your top! Great color! Obsessed with that neon bag! the neon beag you desinged with Mango is amazing! I ADORE this look! The combination of pastels and neon together is just fabulous. I love the outfit, especially necklace and bag! I totally love this look! FAB! Soooooooooooooooooooooooooooooo in love with neon right now! Thanks for putting up a great example of how to wear neon accessories! I don’t do neon but that bag is FAB! Love the color combo. Great! ove the mint neon combo! Love it! The necklace looks so good with this outfit. I wanna look like that!!! Awesome . simple but pretty ! I saw this skirt on sale at ZARa for only 30 euros or so and it still regret not having bought it ! Get ready for tomorrow, shop: http://www.stylegodis.com/ Affordable clothes where trendy meets bohemian! Gorgeous! I would wear this outfit in a heartbeat! i love your skirt & purse! I’m inlove with everything neon at this moment! I very much love your outfit looks great!! Love the skirt – honestly, able to be worn under any condition! love your skirt ! totally agree with you ..its a must have! I really love this look. I want that skirt — I wish they still had it! Me encanta el loook con los complementos en amarillo. Love that skirt! You look amazing. love this entire outfit ! OMG wonderful bag and necklace…. So beautiful,I love this skirt too,you look amazing!! And of course a great outfit hun! Love this mango bag and your skirt. I love this look your necklace is super fab! You look great, I love your mint sweater! omg your bag is a-ma-zing! Love the color of it! Beautiful!!! I can see why you are obsessed with this skirt!! I love the mint shirt too!! Wow, this is a stunning look you’ve put together! Honey, that colour combination is amazing! You’re such a show stopper! I have a very similar leather skirt from Zara and I also bought it 2/3 years ago! To be seen on my blog soon! I love the neon bits!! This is the cleverest way to wear mint – with black! It tones down the whole outfit avoiding it from being over the top! Fabulous!! Completely in love with this look! Su. One of my favorite outfits of all time!!! brilliant! I loved the colors… the skirt is so pretty! Great outfit dear! I really like ur bag!!!!! What’s the brand? I’m obsessed with leather and the skirt being leather is pure perfection, And it’s black-which makes it even more amazing. That mint green top is so nice! looks great! This look is so me:-) You look really pretty! Your bag and necklace – it is chic. A red lipstick, it’s your calling card. Suits you this makeup! Love the mint with the pop of neon yellow! Looking amazing!! Really nice skirt! Damn girl, you are killing it in this outfit!!! Love the neon! Wow! You look stunning!! Love everything about this look! I love the understated elegance! You look amazing in mint. I love the mint paired with your red lips. Perfection! I like the way you use the same clothes many times, but you can make they look so different in all the outfits!! I love the colour mint at the moment!